Remember Oregon’s Driver Card Referundum? November elections are coming up, and it’s time to get out the vote! Driver’s cards will provide transportation to the many undocumented community members living in Oregon, and ensure safer streets by holding all driver’s accountable. We know that the Driver Card issue impacts our families and close community members, which is why ILG has pledged to register voters before the election. But we need your help! If you are a U. S. citizen and are not yet registered to vote, call our office at (503) to find out how. Learn more about why you should register to vote now by clicking here. If you are currently undocumented but think that you might qualify for citizenship, click here to learn more about the application process and citizenship benefits. Remember––if you are not an American citizen, do not attempt to vote! You may put yourself or your family members in danger by doing so. Don’t worry––even if you can’t register to vote, your voice still makes a difference. 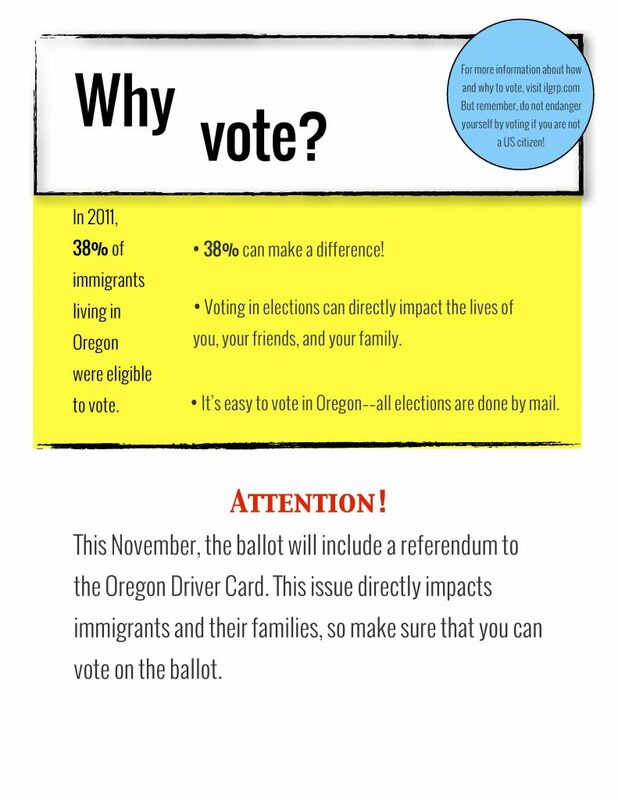 Learn more about how you can impact the Driver’s Card Referendum here.